You’re out with your partner at a party, club, or in another social setting. A person comes up to him or her and begins to flirt. You are irritated at first, but because your mate is not stopping the obvious (to you) overtures of this other person, your jealous feelings become inflamed. This scenario is, unfortunately, all too common. And, believe it or not, the way you choose to respond to such a situation can mean the difference between connection and distance in your relationship. Here are some possible choices you might make to handle someone flirting with your partner…. You might firmly re-direct your mate’s attention away from this other person and to you. You could say and do nothing but then let your partner clearly know that you will not tolerate him or her allowing this type of thing in the future. You might storm out of the room leaving your partner with this other person. You could also say and do nothing and just swallow your feelings. There are always many many possible responses to choose from in absolutely any circumstance. It is important to remember that as intensely as you might feel in any moment, you always have choice. Because when you simply react to flirting from your jealous emotions, you will undoubtedly make the whole situation more difficult. When you feel your stomach clench, your heart begin to race or your palms tense and sweat as your jealousy is triggered by the flirting, it’s time to remind yourself that you get to decide how to respond. And as you make this decision we want you to ask yourself this question…. As upset and out of sorts as you might feel watching someone else flirt with your mate, take just a few seconds to breathe and inwardly pose this question to yourself. Is it more important to you to get the other person away from your mate or is it more important to move closer to the one you love? There truly are no “right” or “wrong” answers here. Circumstances can be quite varied. When you become clear within yourself about what you want and what is most important to you, then you can often choose a response that will help point you in the desired direction. Focus mostly on your connection with your mate. Make it a priority to connect and stay connected with your partner. 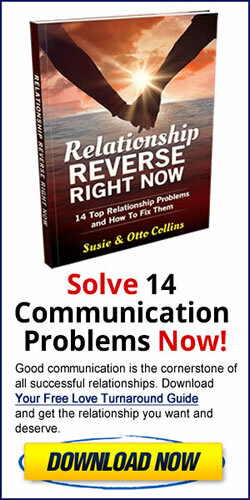 Do your part to keep communication between the two of you honest and open. This might entail learning new ways of sharing and listening. Build the trust in your relationship through communication and by following through on agreements and promises. These are just a few ways that you can stay close and connected in your relationship. And with a solid base, jealousy will not be as big an issue– if it’s there at all. With a healthy sense of trust, any flirting that another does with your partner might hardly register with you and it will certainly be less likely to cause you the pain and upset that it is now. It might be that your response to another flirting with your partner is a subtle look or touch that passes between you and your mate. Because of your strong connection, it becomes a non-issue and the two of you easily move on. If that scenario sounds appealing to you, make it your goal and then begin to enact the changes that will help you move closer to that goal relationship. Make requests and agreements to support the relationship you want. As you do the internal work reminding yourself of your priorities and choosing how to respond, you can create agreements with your partner. It is probably not the best time to make an agreement when that other person is standing there. When the two of you are alone and you are feeling close to one another, propose an agreement for how you both could handle a flirting situation. Perhaps your mate is just as uncomfortable with the flirting as you are but doesn’t want to offend the person doing the flirting. Maybe your partner defines flirting differently and doesn’t interpret specific behaviors as flirting the way that you do. Really listen to one another and try to understand how your partner views a particular situation and what he or she wants to do to resolve it. Come to an agreement that you both can feel good about. If you still find yourself in a social setting in which someone is flirting with your mate and you feel jealous, you can certainly choose to make a request in that moment. Again, be sure you are responding in accordance with what you ultimately want and that you aren’t merely reacting from your intense feelings. For example, you might politely enter the conversation between your mate and the other person and request that your partner join you for a breath of fresh air outside, at a table, for a dance, etc. person and join you or not. When jealousy arises within you in the face of flirting, it is not a forgone conclusion that an argument or upset will erupt between you and your partner. In that moment you can make choices about your response and you can create agreements with your mate in advance that can help defuse a difficult situation.